It's the Wednesday Edition of my Week in the Life documentation. If you want to see the journalling of my day, make sure to click below. I am loving this process. I love to read the stories. I love to build the layouts. Honestly, I usually feel like I need more "stuff". Yes. Stuff. But whenever I put anything on the layout, I didn't like it as much. I like the simple. I like the writing and the pictures as they are. 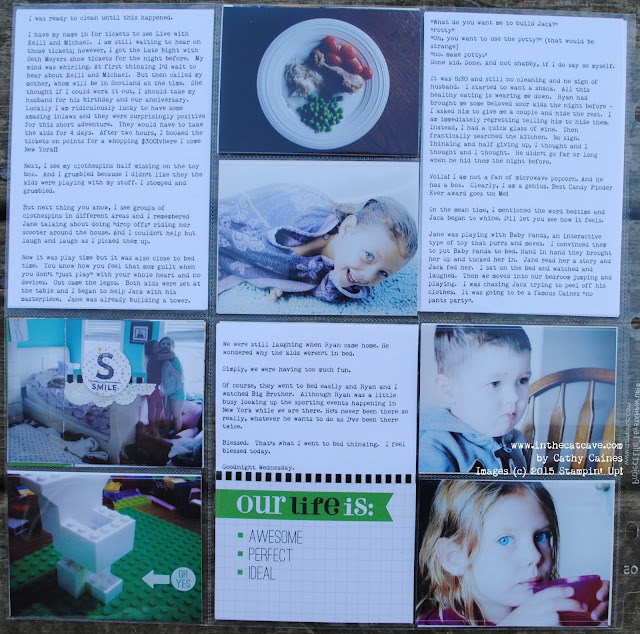 As I mentioned before, I am using the Stampin' Up! Project Life kit called "This is the Life" - both the cards and the accessory kit. You can see that I stapled the gold "hello" die cut from the Greetings Thinlet. 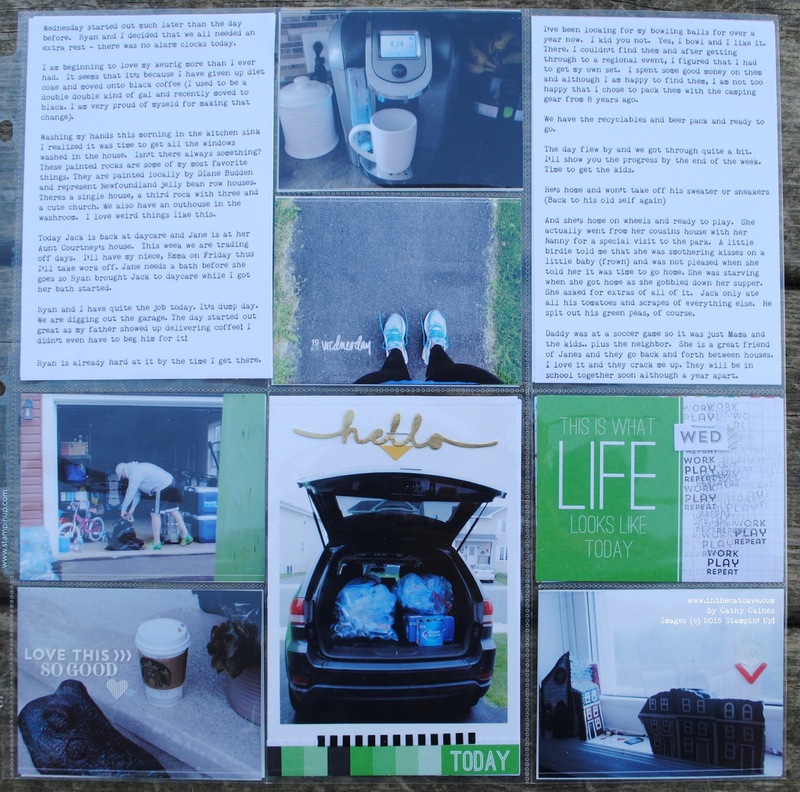 In addition, I altered one of the Project Life cards. On the card below that states "This is what LIFE looks like today", I stamped repeatedly a "Work, Play, Repeat" on the right hand side. This stamp comes from the This is the Life Project Life polymer stamp - it coordinates with this kit. I also added one of the stickers from the accessory kit. I like the way it turned out. In the This is the Life Project Life Accessory Kit, you receive some clear white stickers. These stickers are incredible on photos. I just love them and used them several times in this layout. 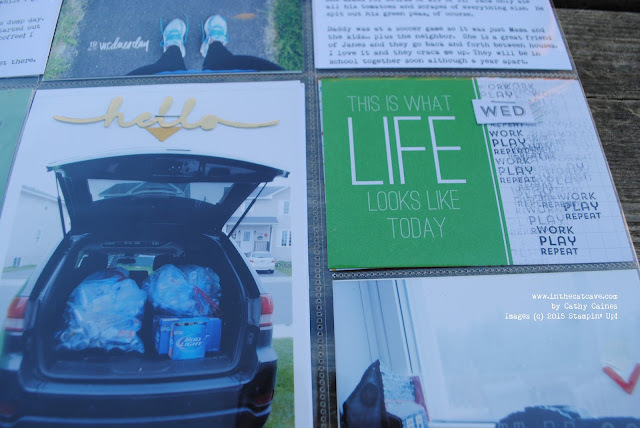 The backside of the layout continues with the story of Wednesday in my "Week in the Life".